First boil the potatoes and peel them after they cool down. Mash the potatoes well. Avoid any lumps or small pieces in it. Now add the chopped green chillies, garam masala powder, red chilli powder, amchoor powder and salt. Add the mixture of the above spices with the mashed potatoes very well. Keep tasting the potato batter to adjust according to your taste. In another bowl, take gehu ka atta. Add salt, oil and about half of the water. Bring the mixture together and knead into smooth soft dough. Cover and keep the dough aside for 20 to 30 minutes. Pinch two small balls from the dough. Flatten them and dust with gehu ka atta. Place the potato filling of the rolled dough, circle in the center and keep about 1 inch empty space from the sides. Gently place the second circle on top. Press and seal the edges with your fingertips so that the filling stays compact inside. Dust some flour on the stuffed paratha and roll into a round, the size of a normal roti. On a hot tava, place the rolled paratha. The tava shoud be hot and not at a low temperature. Cooking parathas at a low flame will harden them. Parathas ideally are crisp on the outside and soft inside. Spread some ghee on the partly cooked side. Flip again and this side has to be cooked more than the previous one. Spread some ghee on the other side too. 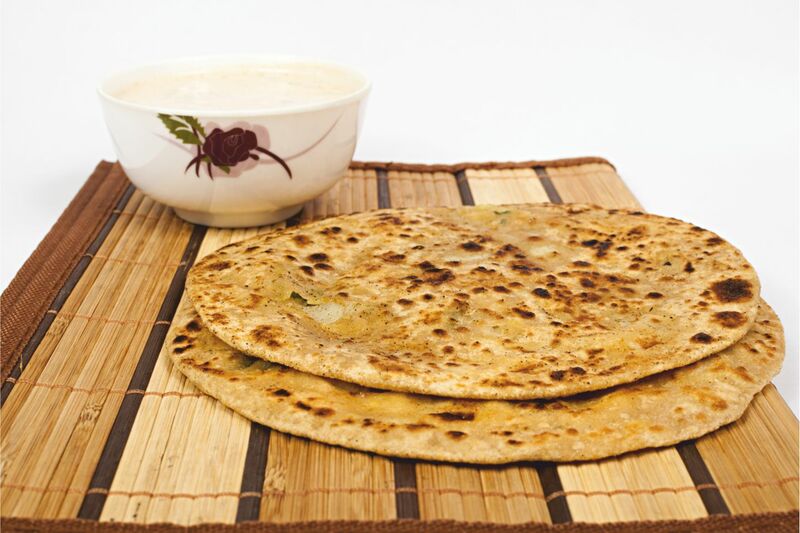 A well made and well roasted paratha will puff up. Serve hot with pickles, chutneys & white butter.